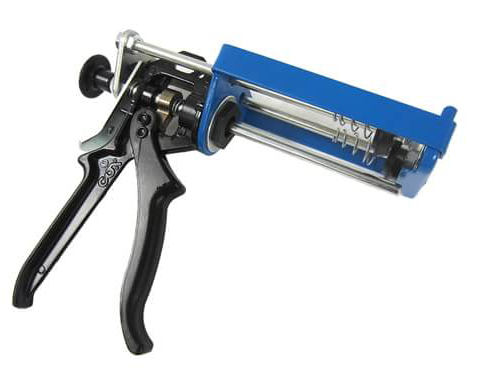 APP’s Manual Dual Component Applicator (EX-500) is a robust, metallic applicator that allows for epoxy to be dispensed easily and reliably at a constant ratio. The applicator removes issues with human error and cleanliness and will allow for a consistent installation every time. It can be reused over and over again and will fit most two-part 6oz adhesive cartridges. We recommend purchasing enough for each person doing installations to have a dedicated applicator. Pull rods back using the black knob before inserting epoxy cartridge. Plungers fit seamlessly into the bottom of the epoxy cartridge. Handle allows for gradual epoxy release at a consistent 1-to-1 ratio.